“Who is 5G for?” is a question a lot of tech writers and business pundits are asking right now. Phone companies are tripping over themselves to release 5G smartphones, with the likes of Samsung, Huawei, LG, OnePlus and many more announcing 5G variations on existing phones or entirely new handsets – despite the fact 5G networks aren’t in place. When it is in place, by the end of 2019 or beginning of 2020, 5G will provide much faster internet speeds of up to 1Gbps and a more reliable connection than 4G – but who will benefit from these incredible connection speeds? Could the Samsung Galaxy Note 10 have a 5G model? What do we expect from the new iPhone 11? At the moment Netflix requires 1.5Mbps to stream movies, while games require a slightly faster connection, with Fortnite needing around 3Mbps, and HD video streaming requires faster speeds still at 5Mbps – but even that’s a fraction of the peak 4G speed of 100Mbps, let alone 5G’s 1Gbps (or 1,000Mbps). Of course not everyone gets peak 4G speeds, with most providers’ speeds sitting between 15Mbps and 30Mbps; but it’s rare to be in a situation where 4G speeds aren’t enough, so 5G seems rather excessive – which brings us back to our original question of who, exactly, needs such speeds. Sure, movie fans will benefit from faster downloads, but that’s more of a convenience than a game-changer, and while 5G will have important applications in the area of autonomous vehicles it’ll be a few years yet before driverless cars take to our roads in a big way. In the short term, though, it could be gamers who’ll be among the first to enjoy the benefits of 5G, thanks to Google’s unveiling of its Google Stadia game-streaming platform. Google Stadia is a cloud gaming platform – that means you’ll be able to play games on a computer, tablet or smartphone without downloading them, as Google’s cloud computing network will power the game, so all you’d need is a solid internet connection. Google is positioning Stadia as the ‘Netflix of gaming’ – you’ll be able to scroll through a menu of games before choosing one to immediately start playing, with no lengthy download required before you can jump into the action. While there’s no information on a release date, price structure, or the number or calibre of games that will be available, if successful Stadia could transform the way we play games. As well as playing on your computer or phone you can use Chromecast to play on a TV via your phone, using a new Stadia Controller designed by Google. Since all the processing for the game you’re playing is handled by the cloud, you won’t have to have the latest and most powerful devices to use Stadia, but you’ll need a pretty quick connection speed to play online. Google recommends a minimum of 15Mbps, with latency below 40ms and data loss below 5%, but those requirements will increase sharply for games with more demanding graphics, or which require a quick internet speed to play online on top of the streaming speed. Wi-Fi will be sufficient to stream games when you’re at home, but if you’re out and about or somewhere with an unreliable connection you’ll need an alternative – and that’s where 5G steps into the spotlight. What will mobile gaming be like with 5G and Stadia? With the super-fast speeds of 5G available both at home and when you’re out and about, playing both mobile and traditionally non-mobile games on the go will be no problem at all – you could find yourself using the Stadia Controller along with your phone to play Borderlands 3 or Starfield on the train on your way to work, or in a coffee shop. What else does Google Stadia mean for smartphones? If games are processed by the cloud instead of on devices, phones will no longer need the newest and best chipsets to play new games – older handsets with lesser processors will be able to play them too, which could lead to a reduced focus on cutting-edge chipsets for new phones. 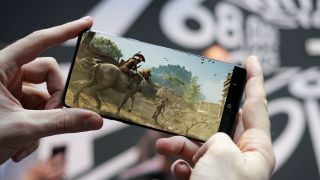 For example the Snapdragon 855, Qualcomm’s latest chipset which runs the Samsung Galaxy S10 and Xiaomi Mi 9, among others, is great for playing demanding mobile games; but if most people are using cloud gaming, such an advanced processor won’t be necessary in the phone. Of course, people use their phones for tasks other than gaming, but as one of the most intensive tasks for a device, it’s one of the main reasons for having an advanced chipset. This in turn could cause a problem for brands that create gaming-specific phones – the Razer Phone 2 and Asus ROG, for example, are positioned as handsets that are great for playing games on, but if any half-decent smartphone can play the newest games, gaming phones’ unique selling point suddenly becomes a lot less unique. Instead of processors, features like displays or speakers could become more important in phones as companies try to angle their device as the best for streaming games and creating immersive experiences. One possible repercussion, however, is that traditionally mobile games could suffer a hit – if they’re able to play the latest and greatest AAA games on a phone, fewer people would be willing to settle for a simpler mobile game, and the increased demand for big-name titles could mean independent studios suffer. Right now we don’t know for sure when Google Stadia will launch, or when 5G will roll out in different regions – both are expected to be widely available by the end of 2019, but that’s quite a big window. For now, then, it’s business as usual – it’s likely companies like Microsoft and Sony will be worried about how Google Stadia could affect the Xbox Two and PS5, and phone manufacturers are probably considering how the shift to cloud processing will influence their design philosophies, but don’t expect anything big to change overnight.